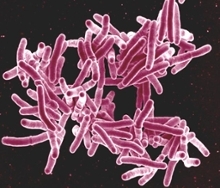 A study published today in The New England Journal of Medicine provides compelling evidence that person-to-person transmission, not just inadequate treatment, is driving the spread of drug-resistant tuberculosis (XDR TB). The study was conducted in the KwaZulu-Natal province, South Africa from 2011–2014, by a team of researchers from Emory University, the U.S. Centers for Disease Control and Prevention, Albert Einstein College of Medicine, and the University of KwaZulu-Natal. It was funded by the National Institute of Allergy and Infectious Diseases at the National Institutes of Health. South Africa is experiencing a widespread epidemic of XDR TB, the deadliest form of TB, including a tenfold increase in cases between 2002 and 2015. The study found that the majority of cases (69 percent) in high HIV- and high TB-burden areas happened due to person-to-person transmission rather than inadequate TB treatment in South Africa. By using social networks analysis, the study identified numerous opportunities for transmission not only in hospitals, but also in community settings, such as households and workplaces. The study builds on a growing body of evidence about the spread of XDR TB through person-to-person contact, and has important implications for efforts to prevent the disease, which have traditionally focused on ensuring that patients receive accurate and complete TB treatment. "These findings provide insight as to why this epidemic continues despite interventions to improve TB treatment over the past decade. Public health and research efforts must focus more intensely on identifying and implementing additional or new interventions that halt transmission in hospitals and community settings," says Neel R. Gandhi, MD, associate professor of epidemiology, global health and infectious diseases at Emory University and senior author of the study. The study included 404 XDR TB patients in KwaZulu-Natal, South Africa and was led by a team of researchers including Gandhi and Sarita Shah, MD, MPH of CDC's Division of Global HIV & TB. Researchers examined the role of transmission by combining robust genotyping methods with social network and epidemiologic analysis. The study is the first of its kind, bringing together these multiple state-of-the-art methods to study XDR TB transmission in a high-incidence setting. "These findings are further proof that we need to better detect, prevent, diagnose and treat drug-resistant TB," says CDC Director Tom Frieden, MD, MPH. "TB resistant to last-resort drugs is spreading through hospitals and homes, at work, and in other places in this high burden community. The only way to stop this disease is by improving infection control and rapidly finding and effectively treating people with TB."